SUMMIT COUNTY, UTAH - The Summit Community Power Works Challenge launched today: a call-to-action for Park City and Summit County residents to lower their impact on the environment by conserving energy, water, and their own money in the process. The interactive online platform, found at www.scpwchallenge.org, challenges residents to reduce their household’s carbon footprints, and creates a way for the community to work together to reduce overall carbon emissions. “Summit County Council is steadfast in our commitment to reduce carbon emissions. We’re excited to leverage the SCPW Challenge to help us reduce our personal carbon footprints, and encourage our community to get involved,” said Kim Carson, Summit County Council Chair. The SCPW Challenge website is a ‘one-stop-shop’ that guides residents through specific actions pertaining to home energy, energy efficiency, transportation, water conservation, and community engagement. The platform offers a range of actions ranging from "easy" to "challenging" with local resources for completing each action, including any available incentives and rebates. Participants can choose which carbon-reduction actions they wish to take, and then track and share their progress. Participants earn points that correlate to carbon savings, and top scorers are highlighted on the website, and prizes will be awarded with each new challenge. One of the most unique components of the SCPW Challenge website is its ability to organize friendly competitions and recognize local environmental heroes. Groups of people can form teams, based on their neighborhood, school, or even social groups. The SCPW Challenge is in line with Park City and Summit County’s carbon reduction goals. In 2016, Park City committed to North America’s most ambitious climate goals: to have a net-zero carbon footprint and run on 100% renewable electricity across the whole community by 2032. In 2017, Summit County committed to be powered by 100% renewable electricity by 2032 and to reduce its emissions by 80% by 2040. Park City, Summit County and SCPW will periodically issue carbon-reduction challenges with awards and prizes to recognize top participants. A New Home for Summit Community Power Works! Summit Community Power Works (SCPW) is launching a new chapter. Now that the Georgetown University Energy Prize competition has closed, SCPW is integrating with fellow energy advocacy organization, Utah Clean Energy. Under the helm of Utah Clean Energy, SCPW will continue its successful engagement with Park City and Summit County residents to save energy and reduce pollution. “Snow is at the heart of our culture and our economy. We’re proud to have incubated Summit Community Power Works and believe that merging with Utah Clean Energy is a win for our community and for locals who are dedicated to conservation and renewable energy,” said Katie Wright, Executive Director of Park City Community Foundation. SCPW was created to vie for the Georgetown University Energy Prize competition in 2014-2016, and through the process achieved phenomenal success in reducing energy consumption and greenhouse gas emissions through multiple community engagement programs. Looking to the future, Utah Clean Energy will be spearheading SCPW’s coordination with local government and community members to build on its successes, and ensure SCPW’s energy efficiency programs continue. However, this transition is not without some sadness, as the leadership of the organization is changing. The Executive Director position held by Erin Bragg since Sept 1, 2017, has been discontinued. Bragg has led SCPW in this transition in creating a pathway to better position SCPW for continued growth. This transition will also mark the end of Park City Community Foundation’s (Community Foundation) fiscal sponsorship of SCPW. The details of SCPW’s new leadership and programming under Utah Clean Energy will be finalized throughout the summer. In the meantime, SCPW will remain alive in the community, available to connect residents and businesses to energy efficiency information at scpw.org. SUMMIT COUNTY, Utah - March 20, 2018 - SuperGreen Solutions, with Summit Community Power Works (SCPW) has helped Swaner Preserve and EcoCenter through a first phase lighting upgrade of all incandescent lights. The EcoCenter was completed in 2008, the first new building in Utah to receive a LEED Platinum rating. At the time, the recommendation for lighting was fluorescent and incandescent type bulbs. Over the past nearly 10 years technological advances have been made and now LEDs are the gold standard for energy efficiency. But when you are a nonprofit and need to retrofit an entire 10,000 square foot building, upfront costs can be a large barrier when funding is prioritized for programming and mission fulfilment. SuperGreen Solutions, a Rocky Mountain Power certified lighting installer, LED expert and supply company, maintains a triple bottom line approach. 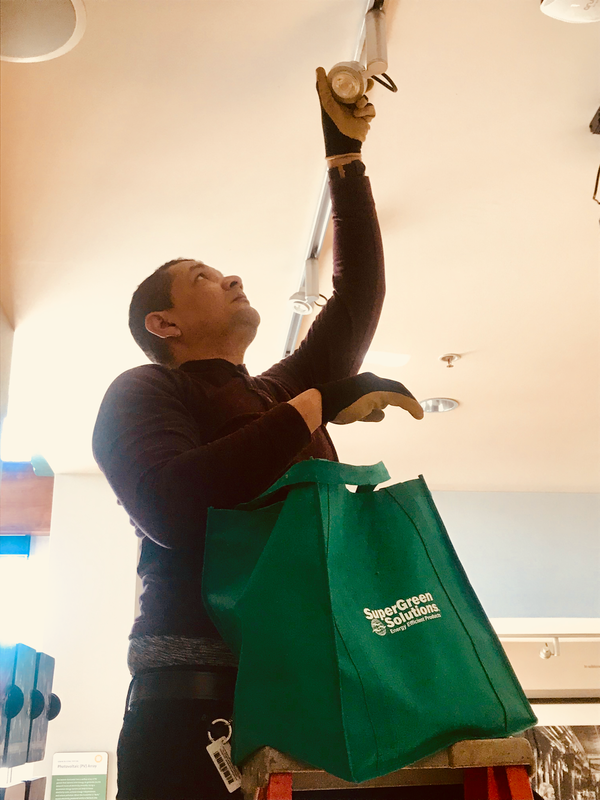 Owner Franco Pedraza, wants more than to execute a lighting retrofit, he wants the client to understand how this choice is not only affecting their wallet but also reducing impact on the environment. Pedraza supplied the LED bulbs and installation for the first phase of lighting upgrades for Swaner at no cost, building upon the efforts of other local non profits like the National Ability Center, Kimball Art Center and Christian Center that also reduced their carbon footprint through LED lighting retrofits. “Advancing the mission of SCPW by reducing energy needs and being able to help a community asset like Swaner is a win win for everyone” says Pedraza. Over the first year Swaner should see an 87% reduction to the lighitng portion of their electric bill and reduce their carbon dioxide (CO2) emissions yearly by 6 tons, which is equivalent to almost 15,300 passenger vehicle miles, or 478 trips from Park City to downtown Salt Lake City. SuperGreen Solutions is a premiere advisor, supplier, and installer of commercial LED lighting solutions. LEDs use approximately 75% less energy than traditional lights and will save an estimated 60%-80% on the lighting aspect of your electric bill. LED lighting offers many benefits as an option to illuminate any space including, extended lifetime, low maintenance, low power consumption, increased brightness and low heat coefficient. It happens to all of us, we don't win all the time and this time our community was not the best out of 49 other communities in the nation at reducing our energy use over a two year period. We did reduce our energy use and lower our carbon emissions, though! Pat yourself on the back for making all the Switches you did, take a moment, and then roll those sleeves back up because we will still need your help to transform our community for the better! Growing up in both Anchorage, Alaska, and Park City, Erin Bragg says she has always had an affinity for the outdoors. Bragg moved to Park City with her family in 1999 and graduated from the Winter Sports School in 2001. She went on to receive a bachelor's degree in psychology from Bates College in 2006 and a master's in environmental humanities from the University of Utah in 2011, according to a press release. As Bragg advanced in her career and education, while maintaining her love of the outdoors, she began to fully understand how everything is connected. "That's how I entered the energy realm," Bragg said. Bragg spent four years as the conservation director of Summit Land Conservancy before she became the sustainability specialist at Summit County. She worked closely with Lisa Yoder, who is the county's sustainability manager, collaborating with Summit Community Power Works on the home-energy score pilot program. This week, Summit Community Power Works named Bragg as the nonprofit's new executive director. Her first day was Monday, September 11. "I'm really excited," Bragg said. "I'm excited to work with the board and see what our next steps will be to get it back in the public eye." Summit Community Power Works was created to spearhead Park City Municipal and Summit County's entry in Georgetown University's $5 million energy-saving competition. Summit Community Power Works is still waiting to learn which communities made it in the top 10. 'The organization has been quiet for a while and we are currently waiting to have that next big announcement, which is what we will be working on as I step into this new role," Bragg said. Matt Abbott, who is the board chair of Summit Community Power Works, said board members have begun exploring how the organization's programs can be applied to the community as an ongoing effort instead of only in pursuit of the energy prize. "We are looking to have more stuff tailored to the community and we are excited to shift our strategy," Abbott said. "We have been focusing on expanding our board to provide a much better base for Erin to work off of." Abbott highlighted Bragg's experience in the community and "great network and strong work ethic." He added, "She has been wanting to run an organization and we were very much in need for someone to run the organization." Former project leader for the energy prize Mary Christa Smith left the organization earlier this year. "She (Erin) has a great education and specific background in what we have been working on," Abbott said. "We are really excited to have someone step into the role for the organization." Bragg said while working with other nonprofits, such as Summit Land Conservancy, she has been able to connect with residents throughout the county, particularly eastern Summit County landowners and understand the dynamic between the east and west ends of the county. "It starts with building those relationships and knowing how to work with the east and west, not just demographically, but also their different socio-economic states," Bragg said. "Like me, I'm just a normal resident who wants to do all of these actions, but I also understand there is a financial constraint to it." In her day-to-day life, Bragg said she rides the Kamas Commuter as often as possible and supports buying local food. Bragg and her husband, who live in Oakley, participated in the home-energy score program and did a bulk solar purchase as part of Mountain Town Community Solar program. "I definitely understand the priority of finances in the household and sometimes it's about changing that mindset," Bragg said. "We (Summit Community Power Works) feel like residents and businesses can really benefit from the knowledge of working with us and Rocky Mountain Power to reduce our energy. As a nonprofit we are poised to help the efforts that Park City, Summit County and other municipalities are putting forward."